Leeds is the third largest city in the country and is the perfect base to start exploring West Yorkshire with a cheap campervan rental. For easy and fast Leeds Airport motorhome hire booking, go to VroomVroomVroom. We have carefully selected the best deals in camper hirel. All you have to do is choose the motorhome and campervan that suits your budget, fill up the form, then get an instant booking confirmation. Most of our RV suppliers can even arrange pick up and drop off at Leeds Bradford International Airport. Leeds Bradford International Airport is situated in the lovely town of Yeadon within the City of Leeds in West Yorkshire. The airport was established as Yeadon Aerodrome in October 1931. It was used for public transport as well as flight training before it was passed on to Bridgepoint Capital in May 2007. The airport is currently the largest within Yorkshire and is considered as one of the busiest airports in the United Kingdom. It serves not only the cities of Bradford and Leeds, but also other cities from the Yorkshire region such as Wakefield and York. St Helena's Caravan Park is the ideal base for travellers who wanted to see the Yorkshire Dales and the cities of Bradford, Leeds, and spa town of Harrogate. The Leeds Bradford International Airport is only 1.3 miles away or just a 3-minute drive to the caravan park. The campsite can be found within the 40-acre grassland and woodland. The family owned business offers 60 grass and hard-standing pitches with electric hook-ups for caravan hire and campervan rental. The campsite is for adults only, but they allow children during special occasions so make sure to contact the owners first before going to St Helena's Caravan Park. Maustin Park Touring and Camping Site is located in Kearby near Wetherby in North Yorkshire. The award-winning park has easy access to the Leeds Airport, which has a distance of 10.6 miles. Enjoy the breathtaking scenery of the river Wharf and the park's superb camping facilities. Campers and tourers can take advantage of free showers and hairdryers. There is also a place where you can wash your clothes and stock your food. If you're not in the mood to cook up your own meal, you can just go to the Stables bar and restaurant for traditional food and relaxing drink. No need to leave your furry friend behind because dogs are welcome in the park. Moor Lodge Holiday Park is the perfect campsite for the whole family because of their first-class facilities. In fact, it has won the “Loo of the Year” award because of its cleanliness and modern interiors. The family run campsite is located in the lovely village of Bardsey, which is nestled between Wetherby, Harrogate, and Leeds. The Leeds Bradford Airport is just 15 minutes away from the holiday park and has easy access to York and the Yorkshire Dales. They have 12 touring pitches for motorhome hire and camper van rental. There are also hard-standing pitches with electric hook-ups for those who are planning to stay longer and a flat camping area for tents. 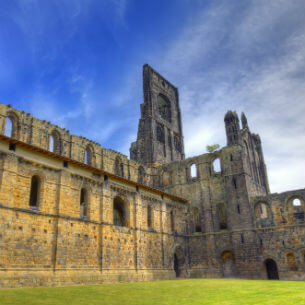 Kirkstall Abbey is nestled in a picturesque parkland near the banks of River Aire. The medieval Cistercian abbey is just 3.5 miles away from the city centre of Leeds and 5.2 miles away from the Leeds Bradford International Airport. It has received numerous recognitions including the Green Flag Award from 2007/08 to 2010/11. The ruined monastery was discovered in c.1152 and was later on given to Leeds Corporation by Colonel North during the latter part of the 19th century. After visiting the ruins, you can take a relaxing stroll along the Abbey Park which features two walking routes. The Royal Armouries Museum is a national museum located on the banks of River Aire near the city centre of Leeds. If you're coming from Leeds Bradford Airport, it will take you around 27 minutes to reach the museum through Chadwick Street and Armouries Drive. It belongs to the Royal Armouries family of museums with other sites found in Fort Nelson and Tower of London. These museums houses more than 70,000 items – from arms and armour to artillery. Apart from the static displays, the museum also features live presentations to further explain the collection. Harewood House is a stately home located right in the heart of Yorkshire and just a 16-minute drive away from the Leeds Airport. The 18th century house was designed by architects Robert Adam and John Carr for the first Baron Harewood Edwin Lascelles. It houses some of the finest art collections in Yorkshire. These artworks can be found in different parts of the house, including the Gallery, Watercolour Rooms, Cinnamon Drawing Room, Music Room, and the Terrace Gallery. Apart from the historic house, check out the award-winning landscape of the 100-acre gardens. You will find an Adventure Playground, picnic area, ice cream kiosks, and café within the area. Visit the Bird Garden to see different species of birds such as Chilean Flamingos and Snowy Owls. Bradford Industrial Museum is situated in Moorside Mills on Eccleshill and around 5.8 miles away from Leeds Airport. The mills where the museum stands was established around 1875 and was developed by Bradford Council in 1970. The innovative museum exhibits a wide range of industrial displays such as printing machinery, textile machinery, steam power, and motor vehicles. You can join their regular workshops and attend special events. Apart from the interesting exhibitions, you can also explore the Moorside House and the Mill-workers' terraced houses.